Der Nordöstliche Teil von Frankreich. 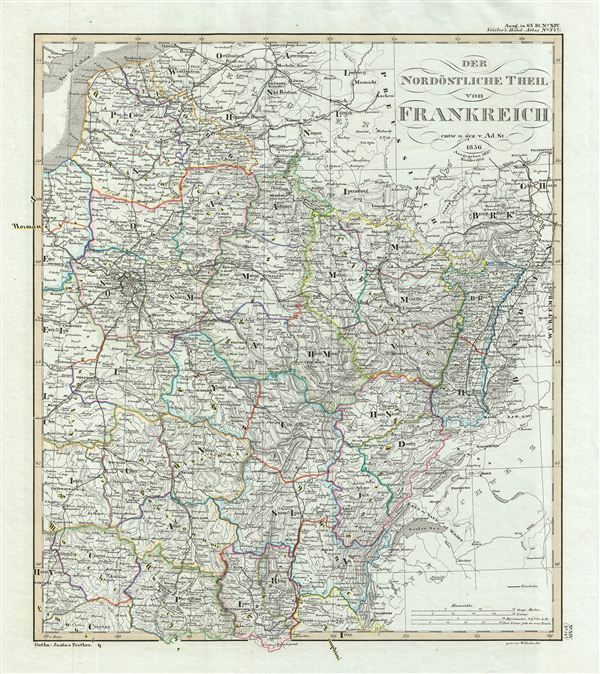 This is a fascinating example of the 1854 Justus Perthes map of northeastern France. It covers from Nord south as far as Loire and from Rhine as far west as Seine Inferior, including parts of neighboring Switzerland and Germany. Map is highly detailed with both political and physical data. Various cities, mountains, roads, rivers and an assortment of additional topographical details are noted. Political and regional borders are highlighted in outline color. Unlike other cartographic publishers of the period, the Justus Perthes firm did not transition to lithographic printing techniques. Instead, all of their maps are copper plate engravings and hence offer a level of character and depth of detail that was impossible to find in lithography or wax-process engraving. All text is in German. Issued as plate no. 14b in the 1854 edition of Stieler's Hand-Atlas.